We thank Dave Bates for judging the show. 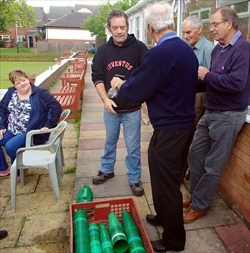 However, when we returned from lunch, the vases had been cleared and the room made ready for another group! So the awards were presented outside. Les Jones wins the NDS Silver Medal . 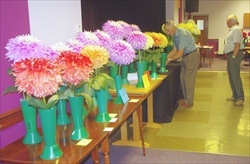 Peter Clubb won the DS Bronze medal for second best in show. Some of the many giants on show. Mike Tunnicliffe cleans up in the novice classes with 3 1st prizes. 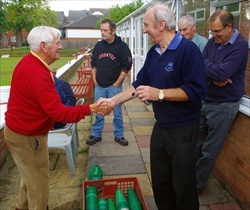 Mike won with Sir Alf Ramsey, Hillcrest Candy and Weston Miss. Below, Mike receives his medal from Ron.